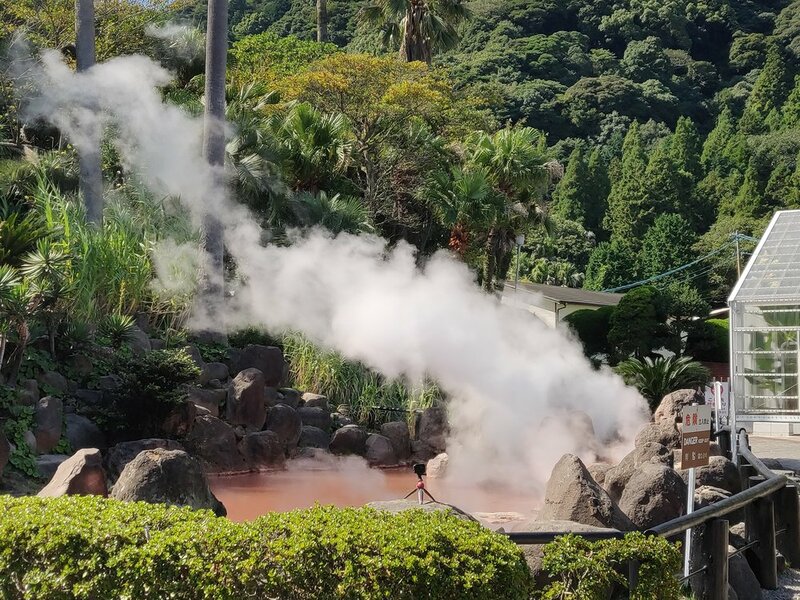 I arrived yesterday in the city of Beppu well known for hotsprings and mudholes. This city is in between the ocean and the mountains. After one night in a standard room I took a bus high in the mountains to see some hotspring. Of course I missed my stop and and ended up far away from where I planned. Walking back to the right bus station stop I've noticed a smoke coming out some trees. That was a hotspring with mudholes. I stayed there sitting , watching the mud and the steam. I could have stay all day I think. An old gardener was gardening, some dragonflies were playing around, the sun was high in the blue sky. Thst was perfect and simple. O like simplicity more and more. After walking a fair amount of time around I found a place where you could have a nice and hot bath. This outdoor onsen was amazingly relaxing. I loved it! The day after I took a very funny train ride from Beppu to Yufuin! This is an old train with only two wagons and most of the time there is only 1 track. This is not a fast train, that is perfect to enjoy the vue. What an adventure! Simple but magic!!! Listening to the sound of the train and discovering a new landscape after every tunnel. I'm sitting now next to the river watching the Mt Yufu and enjoying a small lunch I bought at 7eleven the convenient store. 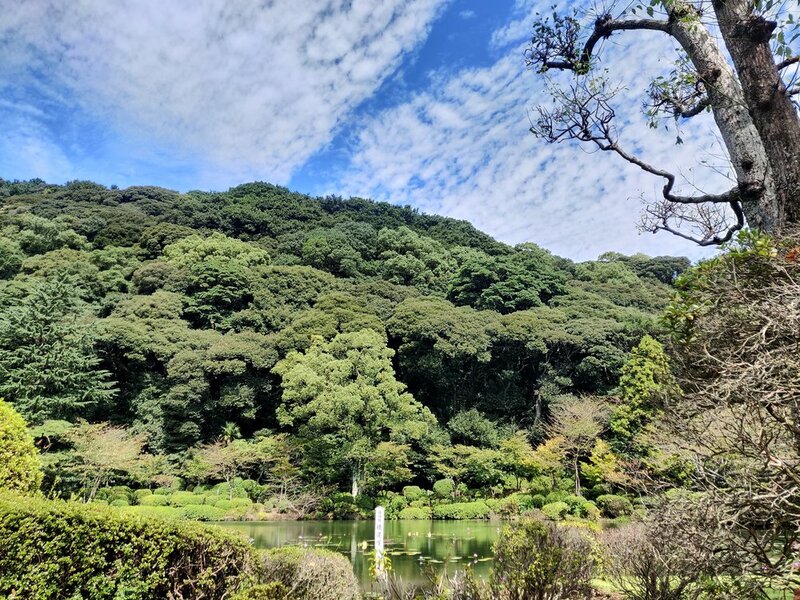 The weather is beautiful today and I decided to walk around to the two shrines 30 minutes away from the center. I'm planning to walk to Mount Yufu tomorrow let see if it goes at plan. There is only one track open the other ones have been close because an earthquake apparently. I spent my first night in a ryokan where the onsen was very relaxing. When I arrived there that was lunch time and I could hear people singing! That was a karaoke for elders! Finally the day after the weather was misty and rainy, so I decided to go to check on the little lake and to check-in early in the next place I will stay. That was totally different that the first one which was more an hotel ryokan. 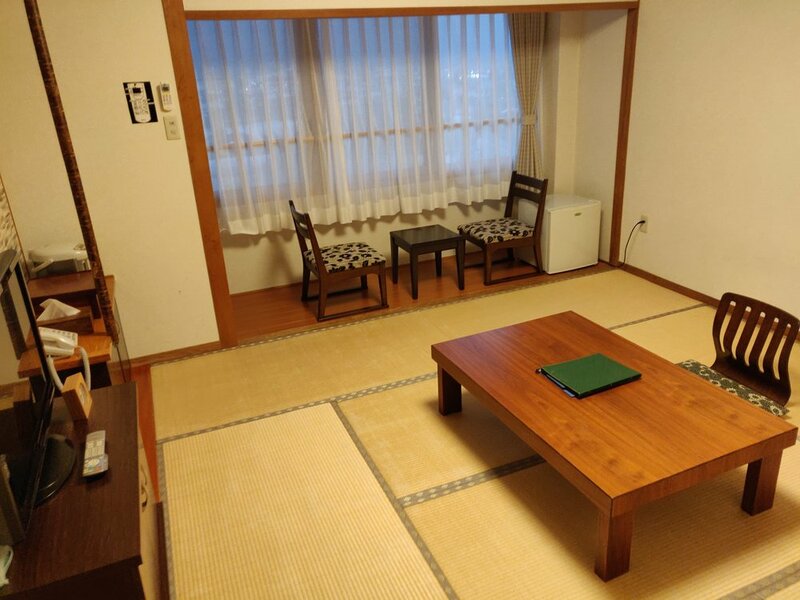 This one was a typical Japenese guest house. I was welcome by a very nice old lady who only speak Japenese and that was perfect! With a smile everyone can understand each other. 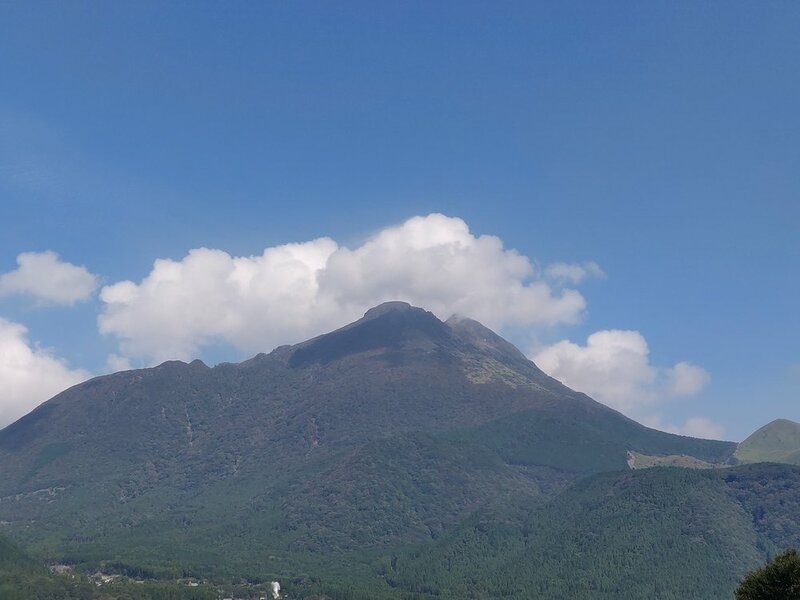 I decided to enjoy my tatami room and the onsen with the vue on mt yufu. Yes this is the third time I'm taking onsen bath in this post haha!!! I really love it!!! And this one was a private outdoor onsen! So far the best I had in Japan! Onsen are very good to wash and relax your body but your mind as well. Going in and out the bath enjoying the cold and the hotness of the water. Sometime on long travel like that you feel a bit tired of moving everyday in a different place. I know that taking some time like that look like holidays and it is indeed, but it's a bit different than staying at the same place during two weeks enjoying the sun, coktails and relax. Theses two days have been amazing here, that's definitely a place I'll come back in the future! The landscapes are fantastic. 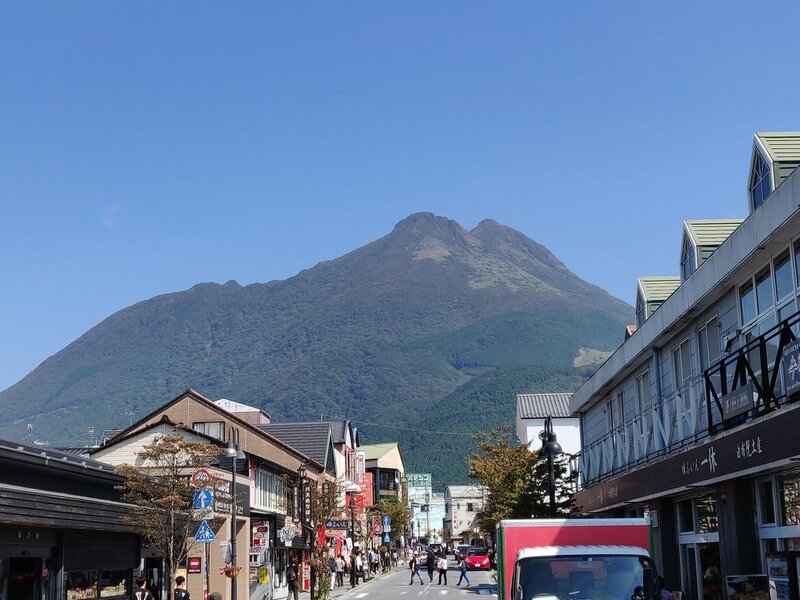 Today it's time to leave the beautiful people and mountains of Kyushu! I wanted to stay more to be honest but it's time to travel north, otherwise I'll be a bit on the late side to arrived in Hokkaido. I choosed to do a big jump and I'm in the train to Hiroshima to spend two days there.